The Advanced PureAir “Air Shield” Air Purifier (what a mouthful!) is absolutely jam packed with filters and features to keep the air in your home clean and clear of dust, allergens, pollens, molds, bacteria, dust mites, smoke, germs, pet dander and more. Covering an area of up to 800 sq. 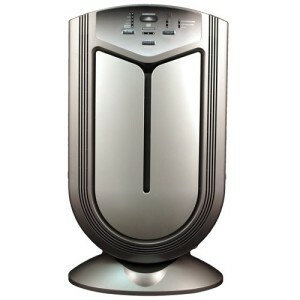 ft. this unit has made it onto our list of whole house air purifiers. 9-stage detection, filtration and purification. Automatic sensors to monitor dust and odors. The Air Shield is truly an all-round air purification system. Although priced at the high-end of our ‘budget‘ range of air purifiers, this one can really be classed as two or three systems rolled into one. Most of us are not just looking for an air purifier for our allergies, or to control germs in the home – we want something that can purify all of the airborne pollutants at the same time. Well, the Air Shield covers more bases than most other air purifiers you will find at this price point. So if you’re looking for a unit that ‘has it all’, add this one to your list. Dual Photo Catalyst Nano-TiO2 Germicidal Sanitizers. The sensors monitor pollutants in the air and in your filters. On ‘automatic’ mode, the fans will ramp up whenever the air quality worsens. This ultimately saves on running costs and gives you peace of mind. The diagnostic sensors monitor the build up of pollutants in the filters and tell you when it’s time to clean or replace them. The pre-filter and electrostatic dust collector capture what they can, which in turn extends the useful life of the HEPA filter (which will eventually need replacing). These are followed by an activated carbon filter which absorbs odors, fumes and gases. The combination of the germicidal UV light and the Photo Catalyst filter is super effective at destroying bacteria, viruses, molds and mildews. The Photo Catalyst filter is also said to be effective at rendering VOC’s (volatile organic compounds, ie. chemical fumes) harmless. The final piece of the puzzle is a Negative Ion Generator, also known as an Air Ionizer. We have a great page explaining what an air ionizer is if you would like to read further on the topic. In a few words though, they cling onto and weigh down positively charged particles in the air (dust, germs, allergens etc) and bring them to the ground. A surplus of negative ions in the air has great ‘mood-lifting‘ qualities also. Forests, beaches and waterfalls are good examples of places you will find high doses of negative ions in nature. So now we can bring that feeling right into our own homes. All-in-all, the Air Shield Air Purifier is a relatively inexpensive way to take control of the air throughout your whole house. With a 1-year warranty on the unit, and a 5-year warranty on the motor (the only moving part), this one is a safe investment in your home environment. Previous story Natural Pink Himalayan Salt Lamp 6-7 lbs.